Eisai Inc. announced today that the U.S. Food and Drug Administration (FDA) approved Halaven® (eribulin mesylate) Injection (0.5 mg per mL) for the treatment of patients with unresectable or metastatic liposarcoma who have received a prior anthracycline-containing regimen. This marks the second indication for which Halaven has been approved by the FDA based on a statistically significant extension of survival. This approval was based on the results of the pivotal Phase 3 trial, Study 309, which demonstrated that previously treated liposarcoma patients who received Halaven (n=71) experienced a median overall survival (OS) of 15.6 months compared with 8.4 months for those who received dacarbazine (n=72) (HR 0.51; 95% CI: 0.35-0.75), making it the first single agent to demonstrate an OS benefit in this stage of the disease. Median progression-free survival (PFS), a secondary endpoint, was longer in patients with liposarcoma treated with Halaven than in those who received dacarbazine (2.9 months vs. 1.7 months; HR 0.52; 95% CI: 0.35-0.78). The adverse events seen in Study 309 were consistent with the known profile of Halaven. Serious side effects from treatment with Halaven may include neutropenia, peripheral neuropathy, embryo-fetal toxicity and QT prolongation. The most common adverse reactions (incidence greater than or equal to 25%) in study patients with liposarcoma and leiomyosarcoma treated with Halaven were fatigue (62%), nausea (41%), alopecia (35%), constipation (32%), peripheral neuropathy (29%), abdominal pain (29%) and pyrexia (28%). The most common (≥5%) Grade 3-4 laboratory abnormalities reported in patients receiving Halaven were neutropenia (32% vs. 8.9% in the dacarbazine arm), hypokalemia (5.4% vs. 2.8%) and hypocalcemia (5% vs. 1.4%). The most common serious adverse reactions reported in patients receiving Halaven were neutropenia (4.9%) and pyrexia (4.5%). The most common adverse reactions resulting in discontinuation of Halaven were fatigue and thrombocytopenia (0.9% each). Additional Important Safety Information including use in specific populations is presented below. 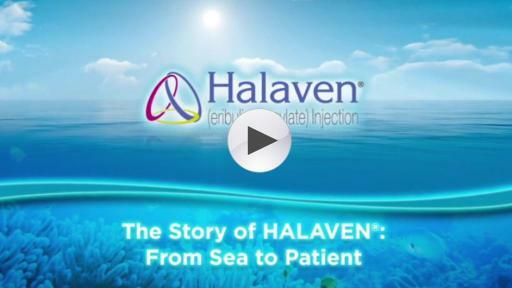 Halaven was first approved in the United States on November 15, 2010, for patients with metastatic breast cancer who have received at least two chemotherapeutic regimens for the treatment of metastatic disease. Previous therapy should have included an anthracycline and a taxane in either the adjuvant or metastatic setting. Halaven is the first and only single agent to significantly extend overall survival in the third-line for patients with metastatic breast cancer. First in the halichondrin class, Halaven is a microtubule dynamics inhibitor with a distinct binding profile. Discovered and developed by Eisai, Halaven is a synthetic analog of halichondrin B, a natural product that was isolated from the marine sponge Halichondria okadai. Based on in vitro studies, Halaven exerts its effect via a tubulin-based antimitotic mechanism, ultimately leading to apoptotic cell death after prolonged and irreversible mitotic blockage. In addition, treatment of human breast cancer cells with Halaven caused changes in cell structure and gene expression as well as decreased migration and invasiveness in vitro. Halaven treatment in preclinical models of human breast cancer was also associated with increased vascular perfusion and permeability in the tumor cores, resulting in reduced tumor hypoxia, and changes in the expression of genes in tumor specimens associated with a change in phenotype. The FDA approved Halaven for the treatment of advanced liposarcoma following a priority review, which is designated for drugs the FDA believes, if approved, have the potential to provide a significant improvement in the safety or effectiveness of the treatment, prevention or diagnosis of a serious condition. 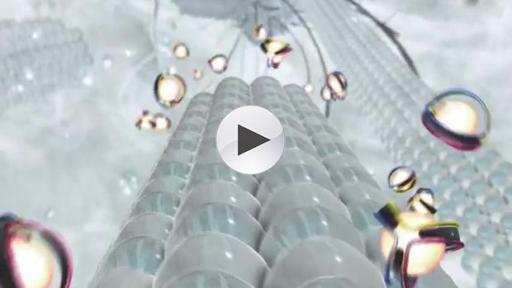 Halaven was granted orphan drug designation for soft tissue sarcoma in the United States in May 2012. Study 309 was a randomized, open-label, multicenter, active-controlled trial of Halaven 1.4 mg/m2 administered intravenously (IV) on days one and eight of a 21-day cycle versus dacarbazine IV on day one, every 21 days (dose range of 850 mg/m2 to 1,200 mg/m2) to patients (n=446) with unresectable, locally advanced or metastatic leiomyosarcoma or liposarcoma following treatment with at least two systemic chemotherapies, one of which must have included an anthracycline, and disease progression within six months of the most recent chemotherapy regimen. In this study, Halaven demonstrated a statistically significant improvement in overall survival compared to dacarbazine. Median OS in all treated patients was 13.5 months with Halaven vs. 11.3 months with dacarbazine (HR 0.75; 95% CI: 0.61-0.94; p=0.011), and PFS was 2.6 months with Halaven vs. 2.6 months with dacarbazine (HR 0.86; 95% CI: 0.69-1.06). The treatment effects of Halaven were limited to patients with liposarcoma, based on pre-planned, exploratory subgroup analyses of OS and PFS. There was no evidence of efficacy of Halaven in patients with advanced or metastatic leiomyosarcoma. Soft tissue sarcomas (STS) are cancers that develop from cells in the soft, supporting tissues of the body, such as fat, muscle, nerves, fibrous tissues and blood vessels. Approximately 12,000 new cases of soft tissue sarcoma are diagnosed each year. Liposarcoma (adipocytic soft tissue sarcoma) refers to tumors that arise from fat cells and can occur anywhere in the body. Liposarcomas make up approximately 17% of all cases of soft tissue sarcoma, accounting for about 2,000 new cases each year. Many patients with STS, including liposarcoma, are amenable to complete surgical removal, yet relapse rates can be as high as 50%, and outcomes for patients with advanced disease are poor. EMBRACE (Eisai Metastatic Breast Cancer Study Assessing Physician’s Choice Versus Eribulin E7389) was an open-label, randomized, global, multicenter Phase 3 study designed to compare overall survival in patients treated with Halaven (1.4 mg/m2 administered intravenously for two to five minutes on days 1 and 8 of a 21-day treatment cycle) versus a treatment of their physician’s choice (TPC) (control group). The study, which was designed to reflect a real-world clinical practice, included 762 patients with metastatic breast cancer who had been treated with an average of four prior chemotherapies. EMBRACE met its primary endpoint of overall survival, showing that patients who received Halaven survived a median of 13.1 months (compared with 10.6 months for patients who received TPC, p=0.041). These results were consistent with an updated analysis conducted when 77% of events had occurred that showed patients who received Halaven experienced a median of 13.2 months of OS versus 10.6 months with TPC. In patients with metastatic breast cancer receiving Halaven, the most common adverse reactions (≥ 25%) were neutropenia (82%), anemia (58%), asthenia/fatigue (54%), alopecia (45%), peripheral neuropathy (35%), nausea (35%) and constipation (25%). Febrile neutropenia (4%) and neutropenia (2%) were the most common serious adverse reactions. The most common adverse reaction resulting in discontinuation was peripheral neuropathy (5%). Metastatic breast cancer is an advanced stage of the disease that occurs when cancer spreads beyond the breast to other parts of the body. In 2015, an estimated 231,840 women will be diagnosed with breast cancer in the United States and nearly 40,300 women will die from the disease. It is estimated that approximately 5 to 10 percent of women with breast cancer will have metastatic disease at the time of diagnosis. Of these women, an estimated one in five is expected to survive five years. 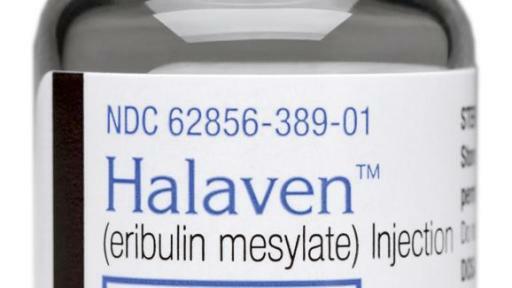 Halaven® (eribulin mesylate) is a microtubule dynamics inhibitor indicated for the treatment of patients with unresectable or metastatic liposarcoma who have received a prior anthracycline-containing regimen. Halaven is also indicated for the treatment of patients with metastatic breast cancer who have previously received at least two chemotherapeutic regimens for the treatment of metastatic disease. Prior therapy should have included an anthracycline and a taxane in either the adjuvant or metastatic setting. Neutropenia: Severe neutropenia (ANC <500/mm3) lasting > 1 week occurred in 12% of patients with MBC and 12% of patients with liposarcoma or leiomyosarcoma. Febrile neutropenia occurred in 5% of patients with MBC and two patients (0.4%) died from complications. Febrile neutropenia occurred in 0.9% of patients with liposarcoma or leiomyosarcoma and fatal neutropenic sepsis occurred in 0.9% of patients. In patients with MBC with elevated liver enzymes >3 × ULN and bilirubin >1.5 × ULN experienced a higher incidence of Grade 4 neutropenia and febrile neutropenia than patients with normal levels. Monitor complete blood cell counts prior to each dose, and increase the frequency of monitoring in patients who develop Grade 3 or 4 cytopenias. Delay administration and reduce subsequent doses in patients who experience febrile neutropenia or Grade 4 neutropenia lasting > 7 days. Peripheral Neuropathy: Grade 3 peripheral neuropathy occurred in 8% of patients with MBC (Grade 4 = 0.4%) and 22% developed a new or worsening neuropathy that had not recovered within a median follow-up duration of 269 days (range 25-662 days). Neuropathy lasting > 1 year occurred in 5% of patients with mBC. Grade 3 peripheral neuropathy occurred in 3.1% of patients with liposarcoma and leiomyosarcoma receiving HALAVEN and neuropathy lasting more than 60 days occurred in 58% (38/65) of patients who had neuropathy at the last treatment visit. Patients should be monitored for signs of peripheral motor and sensory neuropathy. Withhold HALAVEN in patients who experience Grade 3 or 4 peripheral neuropathy, until resolution to Grade 2 or less. In patients with MBC receiving HALAVEN the most common adverse reactions (≥ 25%) were neutropenia (82%), anemia (58%), asthenia/fatigue (54%), alopecia (45%), peripheral neuropathy (35%), nausea (35%), and constipation (25%). Febrile neutropenia (4%) and neutropenia (2%) were the most common serious adverse reactions. The most common adverse reaction resulting in discontinuation was peripheral neuropathy (5%).